PALESTINE EMERGENCY APPEAL Please donate! The Canada Palestine Support Network (CanPalNet) has joined with Independent Jewish Voices–Vancouver (IJV), Boycott Israeli Apartheid Campaign, Building Bridges Vancouver, Canadian Friends of Sabeel, Necef Sabeel Canada, Seriously Free Speech, and Solidarity for Palestinian Human Rights at UBC in the Palestine Awareness Coalition (http://palestineawarenesscoalition.wordpress.com) to bring to public awareness Israel’s steady absorption of Palestinian territory from 1946 to the present day. This design will soon be posted as a wall mural at a TransLink Skytrain station, and a second similar design will be placed on the exterior of Vancouver city buses for a four-week period. Similar campaigns have taken place in New York, San Francisco, Washington, DC and Portland, OR. The four map posters are also being used in various formats by organizations in several countries. Although our campaign has just begun, we've already reached our minimum goal of $15,000. But transit ads are costly, and if we want to reach lots of people in the greater Vancouver area, we need to raise more, much more. You can help by sending a donation. 1) Online, through CanadaHelps (http://www.canadahelps.org/CharityProfilePage.aspx?charityID=s32200). Please select “NECEF” as the charity and the fund designation: “Palestinian Ad Campaign”. (This service charges 3%). Necef Sabeel Canada, P.O. Box 3067, Station La Pierre, Lasalle, QC H8N 3H2. 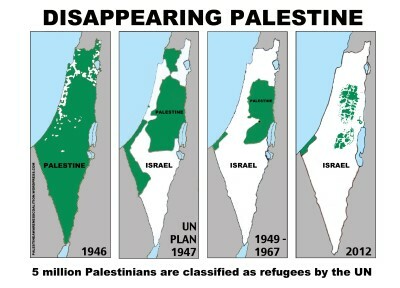 Please put “Disappearing Palestine – CanPalNet” in the online donation special instructions or cheque memo line. Tax receipts will be issued to donors. Download fundraising letter here .